Recognizing the imperiled status of biodiversity and its benefit to human well-being, the world's governments committed in 2010 to take effective and urgent action to halt biodiversity loss through the Convention on Biological Diversity's "Aichi Targets". These targets, and many conservation programs, require monitoring to assess progress toward specific goals. 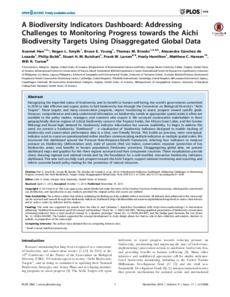 However, comprehensive and easily understood information on biodiversity trends at appropriate spatial scales is often not available to the policy makers, managers, and scientists who require it. We surveyed conservation stakeholders in three geographically diverse regions of critical biodiversity concern (the Tropical Andes, the African Great Lakes, and the Greater Mekong) and found high demand for biodiversity indicator information but uneven availability. To begin to address this need, we present a biodiversity "dashboard" – a visualization of biodiversity indicators designed to enable tracking of biodiversity and conservation performance data in a clear, user-friendly format. This builds on previous, more conceptual, indicator work to create an operationalized online interface communicating multiple indicators at multiple spatial scales. We structured this dashboard around the Pressure-State-Response-Benefit framework, selecting four indicators to measure pressure on biodiversity (deforestation rate), state of species (Red List Index), conservation response (protection of key biodiversity areas), and benefits to human populations (freshwater provision). Disaggregating global data, we present dashboard maps and graphics for the three regions surveyed and their component countries. These visualizations provide charts showing regional and national trends and lay the foundation for a web-enabled, interactive biodiversity indicators dashboard. This new tool can help track progress toward the Aichi Targets, support national monitoring and reporting, and inform outcome-based policy-making for the protection of natural resources.